The 2018/2019 Fire Danger Period commenced on Monday 5 November 2018. The Fire Danger Period is when the CFA restricts the use of fire in the community. This is to help reduce the risk of fires starting and spreading. Visit the CFA website for more information on the restrictions during the Fire Danger Period. We support the CFA by working with the community and local organisations (i.e. Landcare) to prepare for each Fire Danger Period. This is a requirement under the Country Fire Authority Act (1958). •	Can I burn off during the Fire Danger Period? •	Where can I get a permit? •	What can and can’t I do during the Fire Danger Period? During the Fire Danger Period burning off is not permitted unless you have a permit to burn. Applications for a permit are considered on a case by case basis but generally limited to agricultural purposes. To discuss obtaining a permit, contact our Municipal Fire Prevention Officer on 03 5471 1700 or go to the permit application form. To find out what you can and can't do during a declared Fire Danger Period, and on days of Total Fire Ban, visit the CFA website or pick up a copy of the Can I or Can’t I brochure from Customer Service at the Civic Centre. •	What fire district do I live in? •	What is a Fire Danger Rating? 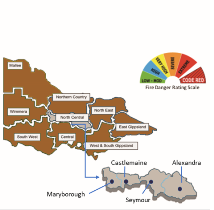 Mount Alexander Shire Council is within the North Central Fire District. Information about the Fire Danger Ratings can be found at the CFA website. The Fire Danger Ratings indicate the risk of fire occurring and are forecast four days in advance. The Fire Danger Ratings take recent weather, rainfall, and predicted wind into account to determine the risk level. •	Why do Council do property inspections? •	What is a fire prevention order? •	How can I report a hazard? This is to ensure that property owners have properly prepared their properties for the Fire Danger Period and removed any fire hazards. Failure by property owners to reduce or clear fire hazards may lead to Fire Prevention Orders being issued. Non-compliance of these orders may lead to heavy penalties being imposed. The first round of inspections are now underway. If you are concerned about a fire hazards at a particular property in your community, you can submit a service request via our website. When submitting the request, please provide as much detail as possible about the location of the property and the nature of the hazard, as well as your contact details. •	How can I prepare my property to reduce bushfire risk? •	Where can I find more information on how to prepare my property? Before the Fire Danger Period begins, it is important that all residents are aware of their own responsibilities and that they take action to reduce the risk of bushfire in their community. •	Clearing your house, garage and shed gutters. Visit the CFA website for more information on preparing your property. •	Do I need a permit to remove trees and shrubs on my property? •	Where can I find more information removing trees and shrubs on my property? Depending on where you live you may be able to remove trees and shrubs on your property without a permit, to reduce the risk of bushfire. This exemption is considered under the 10/30 Rule, 10/50 Rule and fence line clearing. For more information in relation to these exemptions, visit www.environment.vic.gov.au. If you are unsure about the requirements for removing trees and shrubs on your property call our Planning Department on (03) 5471 1700. •	What is the Roadside Slashing Program? •	What areas are included in the program? •	What is included/not included in the program? Our annual Roadside Slashing Program has commenced for the 2018/2019 fire season. The aim of the program is to reduce the likelihood of fires starting and spreading within the shire and to assist with a safe path of travel during emergencies. Works undertaken as part of the program includes slashing, grooming and weed spraying on selected Council managed roads and land identified by council officers and the CFA. The roadside slashing program map identifies the areas across the shire that are included in the program. The maintenance of the nature strip immediately in front of a property in a residential area is the responsibility of the owner or occupier of property. This will assist with reducing the spread of a fire in your neighbourhood and is a legal requirement under Local Law 3, Section 12 clause 2. •	When can I burn off outside the Fire Danger Period? •	How do I get a permit? •	How do I register my fire? •	How to reduce the spread of fire when burning off. •	You can burn off on any Tuesday and Saturday outside the Fire Danger Period. •	A permit is required to burn on any other day of the week. To discuss obtaining a permit, contact our Municipal Fire Prevention Officer on 03 5471 1700 or go to the permit application form. •	You must register your fire by calling 1800 668 511 or download form here. •	Access to a connected hose or a 20 litre container of water must be available while the fire is burning. This is a requirement under the Country Fire Authority Act (1958). •	You can burn off on any weekday outside the Fire Danger Period. •	A permit is not required. •	You must register your fire by calling 1800 668 511. 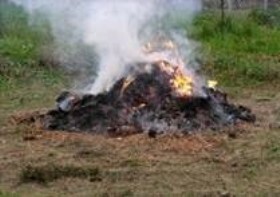 •	Any offensive, noxious or toxic material is not being burnt. All residents must adhere to CFA Fire Danger Ratings at all time of the year, regardless of the Fire Danger Period. •	When is the free green waste disposal period? •	What is green waste? If you live or own property in Mount Alexander Shire, you can dispose of green waste for free at the Castlemaine and Maldon waste facilities from Saturday 20th of October 2018 until Sunday the 4th of November 2018. Green waste includes grass clippings, wood and tree branches less than 10cm in diameter. The waste must be free of rubbish and declared noxious weeds. All residents are encouraged to use this opportunity to prepare their property for the fire season. For more information on our waste facilities and hours of operation, see our website. Plan and Prepare for the fire danger period? •	How I plan and prepare for the Fire Danger Period? Prepare yourself, your family and your property for the fire season by developing a Bushfire Plan. A Bushfire Plan is a written, and preferably well-practised plan to help you and your family be better prepared before the fire season. It will help you to know what to do when you’re at risk of fire. To help develop your Bushfire Plan, use the resources below or the What is your emergency plan? Publication on our website and the CFA website. Another way to be prepared is to download the Vic Emergency App onto your mobile phone. This will help you to access update to date information on local emergencies and set personal alerts and warnings. To find out what you can and can't do during a declared Fire Danger Period, and on days of Total Fire Ban, visit the CFA website or pick up a copy of the Can I or Can’t I brochure from our Customer Service Team at the Civic Centre. In an emergency always call 000. What is your emergency plan? Use this guide to help create your plan.